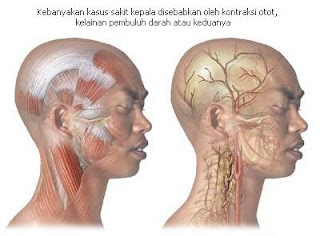 IATA .org- Some types of headaches to make us think it's normal condition and not lethal. But given that it's a headache to severe signal something far more serious and requires serious attention such as stroke, aneurysm and meningitis. These conditions are rare but would be better if we pay attention to the headache that feels different than usual. 1. Neck pain and fever stiff neck and fever may be one of the symptoms of meningitis. Meningitis is an inflammation of the membrane in around the central nervous system and the condition can become critical in a short time. 2. Nausea or vomiting severe nausea and a variety of neuro-deficit symptoms or abnormalities in the body due to a decrease in brain function (such as difficulty speaking or walking) could be a sign of hemorrhagic stroke. Stroke is caused by blood vessels in the brain bursts. 3. Headaches Feel Your Worst ever "First we must be cautious is when someone claims to have 'the worst headache of his life'," said Adam Wilkes, MD, an ER specialist at Lankenau Hospital, Wynnewood, Pa.This could mean that patients suffered an aneurysm, starting with the leak a little blood in the brain can grow long and life-threatening. If you experience symptoms of headache third as above, go to the emergency room and ask your doctor to do a CT scan that can reveal problems that may occur in your head.